Black spanish radish or simply black radish is an edible bulbous taproot in the Brassicaceae family vegetables. It probably originated from the Eastern Mediterranean and Asia Minor regions, unlike other traditional Raphanus cultivars like daikon which took birth in Southern China. Black radish can be almost as pungent as horseradish, which is a close relative. It features rough, black skin and firm, white fleshed inside which is spicy and not as juicy as red-globe or white-icicle radish. Black radish is a cool season annual taproot (hypocotyls), preferring sandy or loamy soil with good moisture to grow. It takes longer to harvest (60 days) than other traditional radish variants. It is quite a hardy plant unlike daikon; because it stays tender and stands well in harsh winters; and do not bolt that quickly if exposed to excess summer heat. Black spanish radish can come in either round (3-5 cm in diameter) or cylindrical shapes (4-6 inches long); similar to in size and shape as red globe radish or slender Icicle radish. However, it characteristically possesses black skin and strong, peppery (piquant) flavor unlike mild and sweet flesh of the salad radishes. Its flesh is crispy and less juicy, and keeps longer at room temperature than other radish types. Their peppery flavor comes from the indoles and glucosinolates chemical compounds. Dehydroerucin, which is specific to radish (R. sativus), is the dominant aliphatic glucosinolate, accounting for over 80% of the all glucosinolates. 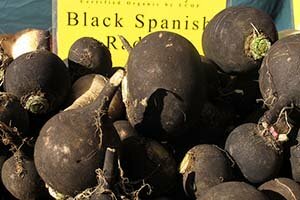 Use of black spanish radish as remedy to many illnesses is in practice since ancient times. A popular Chinese proverb says "when winter radishes are in season, doctors should take a break". Chinese believe that eating radish and other brassica group vegetables such as cabbage, cauliflower, and napa cabbage would bring wholesome health. Black radish has the same calorie value as other conventional radishes. It holds just 16 calories per 100 grams. Nevertheless, it is powerhouse of antioxidants, vitamins and fiber. Black radishes carry higher concentrations of glucosinolates compounds than its white variants. Glucoraphanin is the predominant glucosinolate found in almost all parts of the radish plant. Glucoraphanin is converted into sulforaphane by hydrolysis enzymatic reaction which characteristically gives punchingly pungent flavor to it. Research studies suggest that glucosinalates in the Brassica family vegetables offer anti-viral, immune-boosting, anti-cancer properties. Fresh black radish roots are an average sources of vitamin-C (15 mg or 25% of DA per 100 g). Vitamin-C is a powerful water-soluble antioxidant required by the body for synthesis of collagen. It boost immunity, and helps in scavenging inflammatory free-radicals. In the traditional medicines, the extraction of black radishes is used to treat liver and biliary disorders like indigestion, dyspepsia, gallbladder stones and to cure respiratory ailments, rheumatism, and arthritis. Further, black radishes contain modest levels of B-complex group of vitamins such as folates, vitamin B-6, riboflavin, thiamin and minerals such as iron, magnesium, copper and calcium. Radish, being a member of cruciferous vegetables, carry other phytonutrients such as indole-3-carbinol (I3C) which are detoxifying agents. Experimental studies suggested that anti-estrogenic activities of I3C and DIM (di-indole methane) might help reduce the risk of hormone-dependent cancers such as breast and endometrium. Spanish radishes can be available during the winter months in the USA. Choose, firm black tubers without any spots or blemish. The tops, if still attached, should be bright green without any yellow, shriveled leaves. Avoid oversized, and those featuring tough, woody textured flesh. Also avoid tubers with surface cracks or cuts. At home, severe top greens as they rob nutrients off the tubers. Black spanish radishes keep well for longer time than other radishes. For extended storage, place them in the refrigerator. In the fridge, they keep for several weeks unwashed, without their tops, in a loose or perforated plastic bag. Black radishes are rarely eaten as is because of their strong, biting flavor. Generally, they used in vinaigrette salads or pickling. To prepare, slice black radishes thinly or into sticks, sprinkle with salt, mix well, then cover the bowl and let rest for one hour, then rinse, drain, and use them in side dish, salads, and as an accompaniment in seafood. They can then be flavored with green onions and sour cream, used in salads, or served with remoulade sauce (mustard flavored sauce). They can used with other vegetables like rutabaga in the preparation of steamed, stir-fried or sauteed recipes. Black radish coleslaw is a reilshing side-dish, mixed with shredded cabbage, carrot, and mayonnaise. They also used in soups, stews, and omelets and with tofu. Black radish contains goitrogenic glucosinolates such as glucobrassicin, sinalbin, etc. These substances reduce the production of thyroid hormones such as thyroxine. Other vegetabes in the Brassica family vegetables carrying these substances also include cabbage, cauliflower, broccoli, brussel sprouts, etc. Goitrogens may cause swelling of the thyroid gland and should be avoided in individuals with thyroid dysfunction. However, they may be used in normal diets in healthy persons. (Medical disclaimer). You may also like to read <<- Radish nutrition facts. You may also like to read <<- Turnips nutrition facts. <<-Back to Vegetables from Black radish. Visit here for an impressive list of vegetables with complete illustrations of their nutrition facts and health benefits. Indole-3-Carbinol- Oregon State University: Micronutrient Information center. (Link opens in new window).